This simple, two-step system contains pure Vitamin C, one of the most powerful de-ageing vitamins. From the first application, experience brighter, more radiant skin. With continued use, see transformative de-ageing results: skin that's noticeably firmer, more even-toned, smoother, with visibly diminished lines and wrinkles and a radiant, youthful glow. 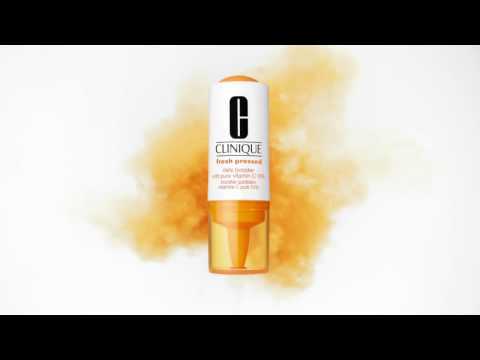 Cleanser: Use in AM to jump-start skin's natural cellular renewal process. 1. Pour powder into wet hand. 2. Add water and work into lather. 3. Gently massage over skin, avoiding eye area. 4. 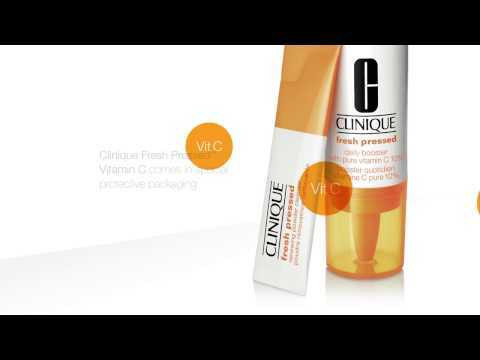 Leave on for 1 minute to capture the potency of pure Vitamin C.
1. Leave cap on. Remove foil. 2. Firmly press inner bulb twice to release Vitamin C powder into the soothing emulsion. 3. Shake 15 seconds, and before each use. 5. Mix 2 drops with your moisturiser AM and PM to power up your regular routine. Avoid eye area. Shake before each use. For full potency, use within 7 days then discard. Note: once activated, Booster retains full power for 7 days but may darken due to normal Vitamin C oxidation. Pour powder into wet hand. Add water and work into lather. Leave on for 1 minute to capture the potency of pure Vitamin C.
Leave cap on. Remove foil. Firmly press inner bulb twice to release Vitamin C powder into the soothing emulsion. Shake 15 seconds, and before each use. Mix 2 drops with your moisturizer AM and PM to power up your regular routine. Make your moisturiser do more. Mix in 2 drops of Clinique Fresh Pressed™ Daily Booster with Pure Vitamin C 10% to enjoy all your favourite benefits—plus a rejuvenating jolt of repair. Power up your de-ageing routine. powered by fresh, potent Vitamin C.
We love your #FreshPressed snaps! Tag your photo on Instagram or Twitter for a chance to be featured in our gallery.